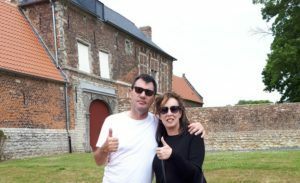 Back in May, I revisited the Battlefield at Waterloo with author and battlefield guide Ian Fletcher, accompanied by one of my favourite travel mates, Denise Costello. Ian and I were on a mission to put together a different kind of Waterloo Tour. He is experienced in battlefield tours and can bring every moment of the Battle to life in a way that is both engaging, educational and exacting – which regiments were where, who was leading the charge, why were certain geographic points chosen by the French and Allied armies, what went wrong . . . . and what went right? 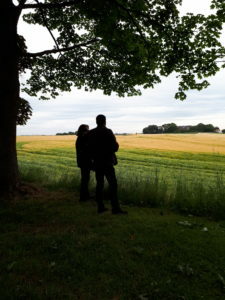 Denise Costello and Ian Fletcher overlooking the Battlefield at Waterloo. On the other hand, my tours are focused more upon social history – which English families were living at Brussels during the Battle, who attended the Duchess of Richmond’s Ball, how did the civilians fare before, during and after the Battle and what wide ranging impact did the Battle, and the victory, have upon life in London and England at large? In an effort to blend these two views of Waterloo, Ian and I hit upon the idea of doing a tour that focuses on the year 1815 as a whole, instead of focusing on the Battle alone. And so the 1815 London to Waterloo Tour was born. 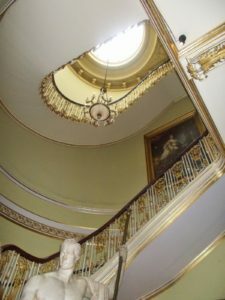 Before the Tour heads for Belgium, our group will explore the London of 1815, including Apsley House and the many clubs, houses, streets and sites that have a connection with the campaign, including the house in St. James’s Square where Henry Percy delivered the captured French Eagles to George IV after the Allied victory. Author Louise Allen will speak to our group on the subject of her book, To The Field of Waterloo: The First Battlefield Tourists 1815 – 1816. Once in Waterloo, we will walk the key sites on the Battlefield and also visit a host of museums and related sites including the superb new Waterloo Memorial with its high-tech exhibits and 3D cinema, the famous Lion Mound and panorama, the wonderful presentation at refurbished Hougoumont and the headquarters of both Wellington and Napoleon. Speaking of Waterloo tourists, below is an account of Dr. Samuel Butler’s visit to the Battlefield a year after the Allied victory. His vivid impressions take in all of the sites we’ll be seeing on the Tour, complete details of which can be found here. July 9th. 1816 —From Brussels through Waterloo to the field of battle, about fourteen miles, through the Forest of Soignies, almost all the way a most detestable pavi full of holes. Waterloo is a miserable village of about twenty houses; its small red brick church, designed in segments of ellipses, is about twenty-five or possibly thirty feet in diameter. Here are monumental inscriptions to the memory of many of our brave country men. In about half a mile from Waterloo we quit the Forest of Soignes, and the ground becomes an elevated plain with some moderate undulations. In about two miles more we come to a place where a bye-road crosses the principal road. Here is an elm of moderate size on the right-hand side of the road, some of whose branches have been torn off by cannon balls; this is the famous Wellington tree, where the Duke was posted during the greater part of the battle, and is somewhat nearer the left wing than the centre of the battle. Close to the cross-road opposite this runs La Haye Sainte, a broken stumpy hedge. Directly opposite this tree, on the road-side, lay the skeleton of an unburied horse, and near the tree itself I picked up a human rib. The whole field of battle is now covered with crops of wheat and rye, which grow with a rank and peculiar green over the graves of the slain and mark them readily. About one hundred and fifty yards below the Wellington tree, which itself stands on the top of Mount St. Jean, in the hollow, is the little farm of La Haye Sainte, where the dreadful slaughter of the German Legion took place; they defended the place till they had spent all their ammunition, and were then massacred to a man, but not till they had taken a bloody revenge. The house and walls, the barn doors and gates, are full of marks from cannon and musket balls. In the barn are innumerable shot holes, and the plaster is still covered with blood, and the holes which the bayonets made through their bodies into it are still to be seen. “In a hollow near this scene of carnage lie the bodies of two thousand French Cuirassiers in one grave, and about twenty yards farther is the spot to which Bonaparte advanced to cheer the Imperial Guard for their last charge; it is scarcely possible but that he must have exposed himself greatly in so doing. The little valley between the undulation of Mount St. Jean, where the British were posted, and that of La Belle Alliance, which was occupied by the French, is not more than about a quarter of a mile across; the Duke of Wellington and Bonaparte, whose general station was on this hill, cannot have been more than that distance, or a very little more, from each other. On going to the station of Bonaparte we had a fine view of the whole field, and, though quite ignorant of military affairs, could not but see the superiority of the British position. The undulation on their side being a little more abrupt than that of the French, they were themselves protected in some measure, and their force considerably concealed, while that of the French was perfectly distinguishable. The right wing of the British was at Hougoumont [rather Goumont], a chateau of great importance and of very considerable strength. 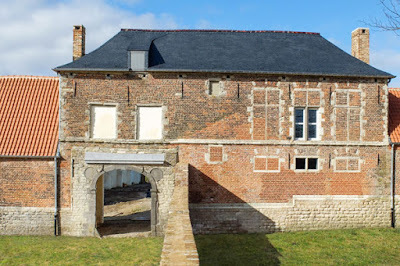 Their left wing was at the end of La Haye, about a short half-mile or less from the farm of St. Jean, which was almost of the same importance for its protection as Hougoumont for that of the right. The whole line could not extend more than a mile and a quarter. The French were posted on the opposite eminence, and here in this small space three hundred cannon, independent of all other weapons, were doing the work of death all day. Our guide, a very intelligent peasant, told us that the whole ground was literally covered with carcasses, and that about five days after the stench began to be so horrid that it was hardly possible to bury them on the left of the British, and of course on the right of the French position. At less than a mile and a half is the wood from which the Prussians made their appearance. La Belle Alliance is about half a mile or a little less from Mount St. Jean; here we turned off to see the chateau of Hougoumont, which was most important to secure the British right and French left wing, and was therefore eagerly contested; four thousand British were posted here, and withstood with only the bayonet and musketry all the attacks of an immense body of French with cannon. 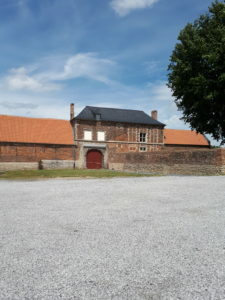 The French were posted in a wood, now a good deal cut down, close to the wall of the garden at Hougoumont. The British had made holes in the wall to fire through, and the French aimed at these holes. The whole wall is so battered by bullets that it looks as if thousands of pickaxes had been employed to pick the bricks. The trees are torn by cannon balls, and some not above eight inches in diameter, being half shot away on one side, still flourish. “Passing round the garden wall to the gates, the scene of devastation is yet more striking. The front gates communicate with the chateau, a plain gentleman’s house, the back ones (which are directly opposite) with the farmer’s residence. This was occupied three times by the French, who were thrice repulsed; but the English were never driven from the chateau. The tower, or rather dovecote, of the chateau was burnt down, but a chapel near it, about twenty feet long, was preserved in the midst of the fire; the flames had caught the crucifix and had burnt one foot of the image, and then went out. This was of course considered a great miracle. From the chapel we went into the garden. Its repose and gaiety of flowers, together with the neatness of its cultivation, formed a striking contrast with the ruined mansion, the blackened, torn, and in some parts blood-stained walls, and the charred timbers about it. 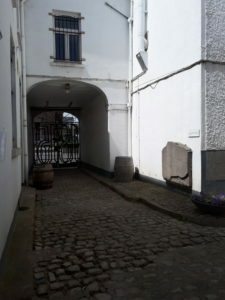 In a corner of this garden is the spot where Captain Crawford and eight men were killed by one cannon ball, which entered opposite them by a hole still there and went through the house and lodged in another wall; I have seen the ball in the Waterloo Museum. Going along the green alleys of the garden, quite overarched with hornbeam, we see the different holes broken by the English to fire on their enemies, and a gap on the northeast angle of the garden is the gap made by the French, who attempted to enter there, but were repulsed. Had they gained entrance the slaughter would have been dreadful, as we had four thousand men in the garden, which from its thick hedges has many strongholds, and they were greatly more numerous. The English also lined a strong hedge opposite the wood in which the French were, which they could not force, but the trees are terribly torn by cannon. 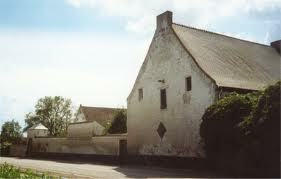 The loss of Hougoumont would probably have been fatal to us. From the gap above mentioned, looking up to the line of the British on Mount St. Jean, is one small bush; here Major Howard was killed. 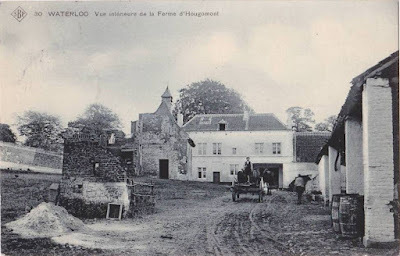 “Leaving Hougoumont, we returned to La Belle Alliance, where we once more reviewed the field of battle, and found some bullets and fragments of accoutrements among the ploughed soil. The crop is not so thriving on the French side, but it was still more richly watered with blood; in fact the soil, which on the British position is rather a light sand, is here a stiffish clay. From La Belle Alliance we proceeded to Genappe, another post, passing by a burnt house called la maison du roi; here Napoleon slept on the eventful eve of the battle. 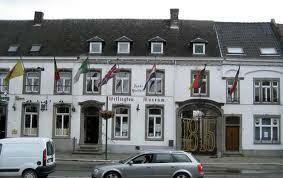 Following the course of the French in their retreat, we proceeded to another post, to Quatre Bras. Here was the famous [stand ?] made by the Highlanders against the whole French Army on the 16th. It is a field a little to the left at the turning to Namur. 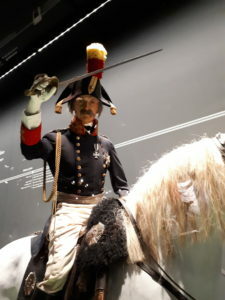 Hence we proceeded, having Fleurus on our right, to Sombreffe, where was the severe battle of the Prussians on the 16th, and thence to Namur, where the French continued their retreat. 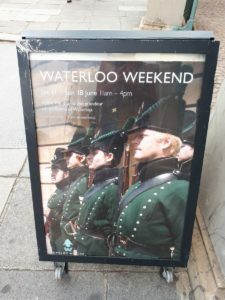 What better place to spend Waterloo Day than in London? 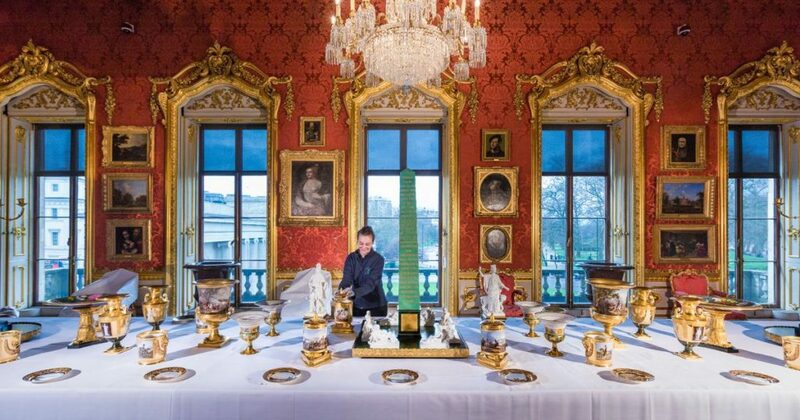 More precisely, at Apsley House. 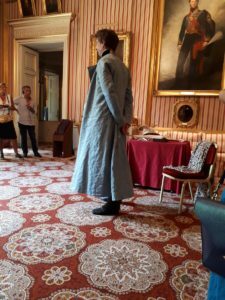 Well before the day, I had planned to meet my old mates Dawn Wood and Andrew Clark at Apsley House, where they were slated to do a series of talks on Regency dress and Napoleonic uniforms over the two day weekend. Upon walking through the front door of the House, I saw one of the house guides, Alex, who I’ve known for some time now. 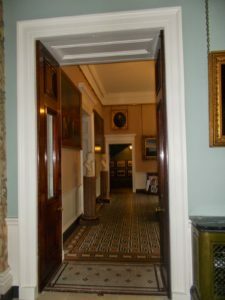 We chatted for a few minutes and then I headed up the stairs to the Striped Drawing Room. 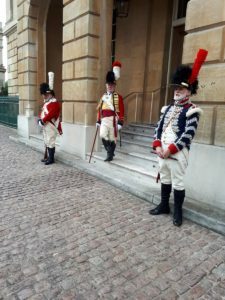 Upon reaching the landing, I spied a bloke in full Napoleonic uniform – it was my pal, Michael Paterson, who is a part of the City of London Portsoken Volunteers re-enactment group. It would have been handy had I snapped a photo of Michael to insert here, but I didn’t. 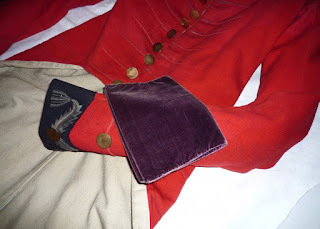 This is John Mead, also with the Portsoken, and an historical tailor who makes all of the Regiments’ uniforms. Michael was on hand to present a talk on Napoleonic soldiers, which was fabulous. He had the crowd enraptured. Before long, Dawn found me and we caught up for a bit before it was time for her talk. 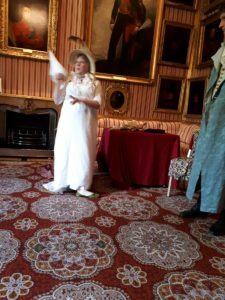 Into the Striped Drawing Room we stepped and Dawn launched into her costume presentation, enthralling the crowd with details of exactly what it took to dress a Regency lady – from the inside out. Beginning in her chemise, Dawn then described each garment she donned, giving us the history of each, detailing the materials that would have been used and the care involved in each piece. 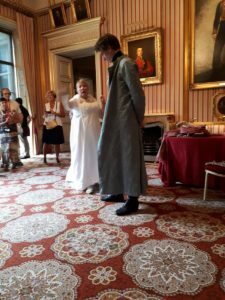 I first met Dawn a few decades ago when she was with a re-enactment group called The Salon, now disbanded, who put on a Regency soiree for one of my tour groups at Gunnersby Park. She and I, and her husband, Andrew, have been friends ever since and they will be on hand in Bath for Number One London’s Georgian Tour, April 2018. 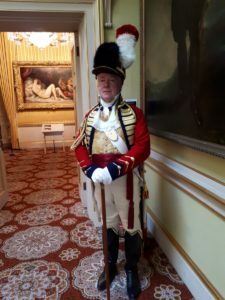 Dawn is a modiste who recreates historic costume and dress, while Andrew is an expert on uniforms and all forms of military weapons and accouterments. Here he is in full Napoleonic kit as Captain Clark. And here he is in mufti as Mr. Clark. Very versatile is Our Andrew. 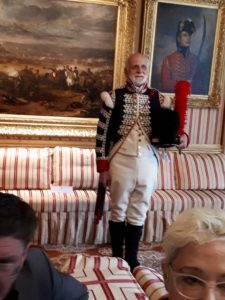 Once the presentations were over with, I nipped off to the Waterloo Chamber, where in honour of the Waterloo Anniversary they had set a dinner table with the Prussian Dinner Service commemorating the achievements of Wellington’s life, as it would have been at one of Wellington’s annual Waterloo Banquets. Naturally, this pronouncement caused Alex and I to look at one another like two deer caught in the headlights. What a turn up. Oh, dear. “You’re Henry’s grandson then,” said I. He’s actually Henry’s eight or ninth great grandson, but why split heirs. “Yes,” replied the Earl. “Fancy your knowing that.” Alex shot me a look, but kept silent. Wise man. “May I ask you a question?” I asked the Earl. And we were off again. The conversation lasted at least another fifteen minutes before the Earl excused himself and left Alex and I alone once more. “No. Not in front of the Earl. I don’t think,” Alex semi-reassured me. Really, I must stop doing that. Obviously, one never knows who one may run into at Apsley House. Speaking of which, upon returning once more to the Striped Drawing Room, who did I find but my mate, Loretta Chase. You can just see the top of her beautiful blonde head in the photo below. Loretta and I had already seen each other several times in London during this trip and I’d invited her to join me at Apsley House on the day. Imagine my surprise when she told me that she’d never been to the House in all her visits to London. I had promised to take her on a Cook’s Tour. I suggested we start on the ground floor and so we sashayed our way downstairs. Where I again ran into Alex. 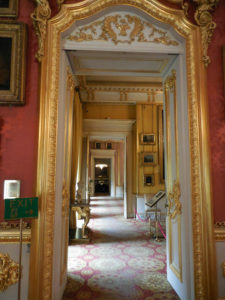 “Don’t they think it’s strange that you’re giving me a tour of Apsley House?” Loretta asked as we turned a corner. 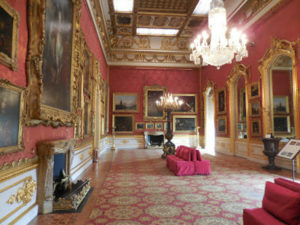 and several other rooms before we found ourselves in the Waterloo Chamber. 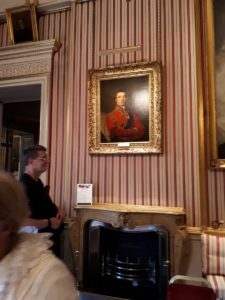 At the end of the day, I left Apsley House replete after seeing old friends and making a few new ones and headed off to dinner in the company of Dawn and Andrew, who both agree with my sentiment – where else would anyone spend Waterloo Day? 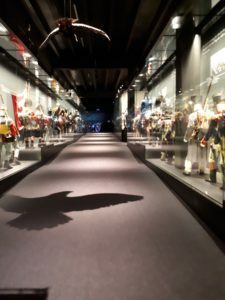 One of the reasons I wanted to return to Waterloo was to see the new museum and exhibits that were put in place for the celebrations of Waterloo 200. The photos above in no way do justice to the scale and scope of the exhibits. The huge hall in the top photo displays a soldier from all of the British regiments on the right, the French on the right, and goes on for quite a ways. In addition, the 4D film of the Battle was incredible – the closest any of us will ever get to the sights and sounds of the day. As you’ll see by the photo above, the design of the theatre puts you right in the middle of the action, complete with surround sound. Denise, Ian and I were the only ones in the theatre, in fact we had the whole place to ourselves. I knew we’d be seeing a 4D film, I understood this when I put the special viewing glasses on, and I anticipated the action when I took my seat. Still, I jumped a foot when the horse seemed to come charging directly at me. I think I may have even screamed a little. 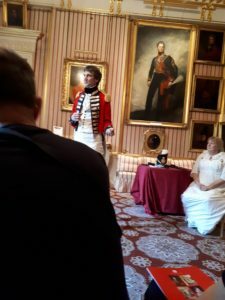 Our next stop was the museum at Wellington’s Headquarters, the house Wellington returned to directly after the Battle and where he discovered his ADC Alexander Gordon laying mortally wounded. 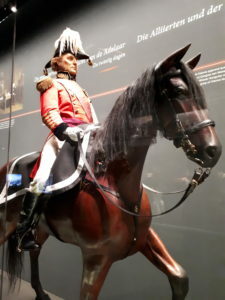 Gordon remains a touchstone of the personal losses attached to Waterloo, but there were many others who died or were horribly wounded that day, whom Wellington knew on a personal level. Waterloo cost Britain the best of its Army and exacted a toll on Wellington that will never be fully known. From Wikipedia: “Gordon received brevet promotions to Major and Lieutenant-Colonel as a reward for carrying to London despatches announcing victory, first at the Battle of Corunna and then at Ciudad Rodrigo. After Bonaparte’s exile to Elba in 1814, Gordon was made a KCB. 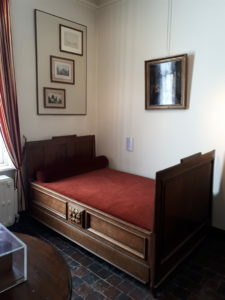 He was mortally wounded at Waterloo while rallying Brunswickers near La Haye Sainte, and died in Wellington’s own camp bed (above) in his headquarters during the night. “I came back from the field of Waterloo with Sir Alexander Gordon, whose leg I was obliged to amputate on the field late in the evening. He died rather unexpectedly in my arms about half-past three in the morning on the 19th. I was hesitating about disturbing the Duke, when Sir Charles Brooke-Vere came. He wished to take his orders about the movement of the troops. I went upstairs and tapped gently at the door, when he told me to come in. He had as usual taken off his clothes but had not washed himself. P.S. Your brother has a black horse given to him I believe by Lord Ashburgham which I will keep till I hear from you what shall be done with it. 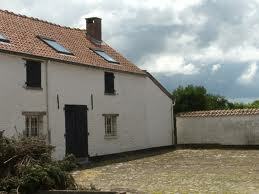 In Part 3, we’ll continue on to the farmhouse at Hougoumont. -The Iron Duke on his troops at Waterloo. 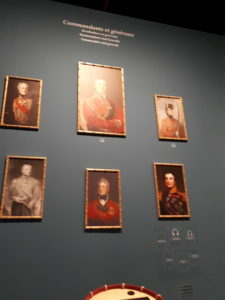 As immortalized in the paintings above, the Duke of Wellington did indeed return to the field of battle at Waterloo, often accompanied by prestigious guests. When he saw the Lion’s Mound for the first time, he lamented, “They have ruined my battlefield.” I don’t think that the Duke objected to the Mound itself, but rather to the fact that much of the dirt needed for the Mound was taken from the famous ridge behind which Wellington had placed his troops at a critical point in the battle. Ordered to lay down, the massive lines of British troops could not be seen by the advancing French, who believed that they had managed to catch Wellington unprepared and that victory would soon be theirs. As the French cavalry advanced, Wellington bided his time until the very last moment, when it is said that he ordered, “Up, men and at them!” Suddenly, the French found themselves confronted by the Long Red Line, fully armed with weapons cocked. Wellington had studied the ridge long before the Battle ever began and came prepared to use it to his advantage should the opportunity arise. The ridge was integral to the British victory at Waterloo and the construction of the Mound had diminished the scale of the ridge. Thus, Wellington was perturbed. I was also perturbed, to say the least, when I first heard rumours of the plans to turn Hougoumont into a B and B. Victoria and I had visited Hougoumont together in 2010 – you can read that blog post here. 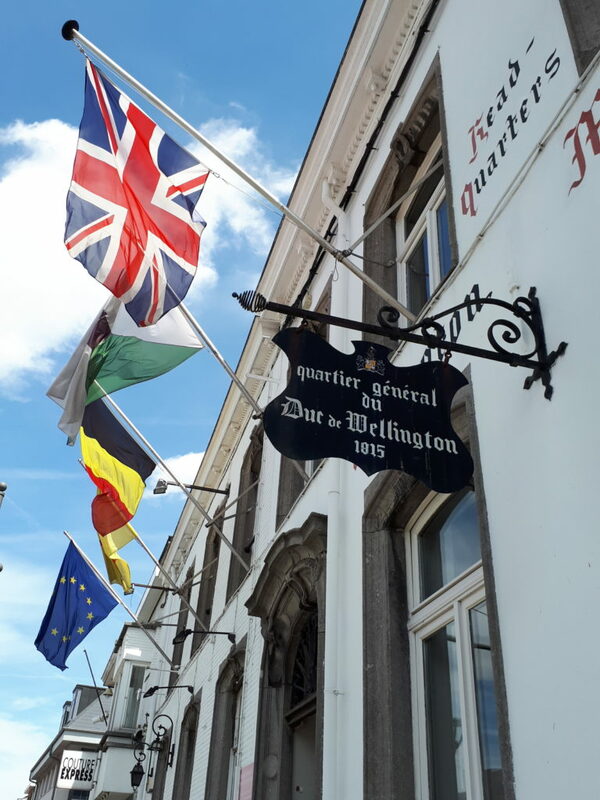 Wellington recorded in his despatches “at about ten o’clock [Napoleon] commenced a furious attack upon our post at Hougoumont” Other sources state that this attack was at about 11:30. The historian Andrew Roberts notes that, “It is a curious fact about the battle of Waterloo that no one is absolutely certain when it actually began”. The initial attack by Maréchal de Camp Bauduin’s 1st Brigade of the 6th Division emptied the wood and park, but was driven back by heavy British artillery fire and cost Bauduin his life. The British guns were distracted into an artillery duel with French guns and this allowed a second attack by Maréchal de Camp Baron Soye’s 2nd Brigade of the 6th Division. They managed a small breach on the south side but could not exploit it. An attack on the north side by elements of the 1st Brigade of the 6th Division was more successful. 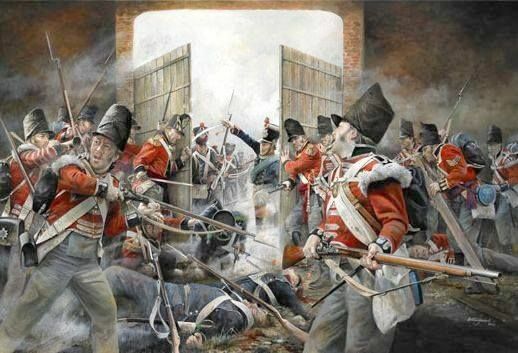 This attack led to one of the most famous skirmishes in the Battle of Waterloo — Sous-Lieutenant Legros, wielding an axe, managed to break through the north gate. A desperate fight ensued between the invading French soldiers and the defending Guards. In a near-miraculous attack, Macdonell, a small party of officers and Corporal James Graham fought through the melee to shut the gate, trapping Legros and about 30 other soldiers of the 1st Legere inside. All of the French who entered, apart from a young drummer boy, were killed in a desperate hand-to-hand fight. Most of the farms are private and only visible from the outside. 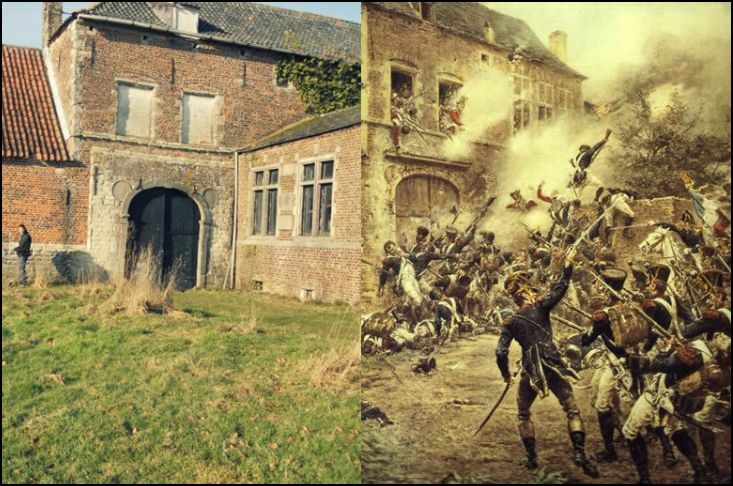 The glorious exception is Hougoumont, where three Guards regiments secured Wellington’s right flank throughout the battle. 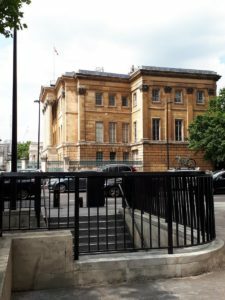 In danger of collapse a few years ago, it is now being restored – thanks in part to a surprise £1million grant from the UK Treasury – and its official public opening will be a centrepiece of next June’s bicentenary celebrations. The trees here are still bark-scarred by grapeshot, doors are riddled by musket balls – testimony to the more than 6,000 men killed or wounded in its attack and defence. 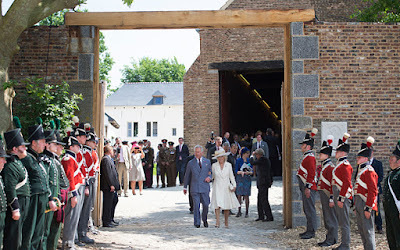 Several years ago, Project Hougoumont, supported by the late and present Dukes of Wellington, had undertaken the monumental mission of restoring Hougoumont and the surrounding land in order to preserve this most important site. You can visit the Project Hougoumont website here and watch a very informative video regarding the site featuring historian and presenter Peter Snow. 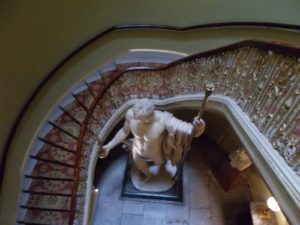 We have had a link to the Project in the left hand sidebar of this blog for over a year now and we applaud their efforts to save the site for future generations to appreciate. 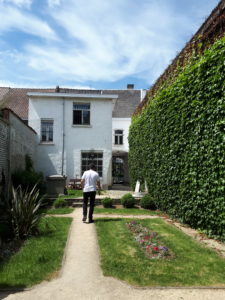 To repeat, upon learning of plans to turn Hougoumont into a B and B, I was perturbed. Okay, outraged might be closer to the mark. How could anyone be allowed to turn this sacred site into a money making venture? 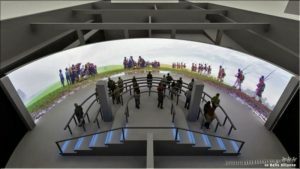 What was next – Waterloo Land? Wellington World? How had such a venture passed through the scrutiny of such a venerable restoration committee? elevations has been left exposed, as it was during the battle. 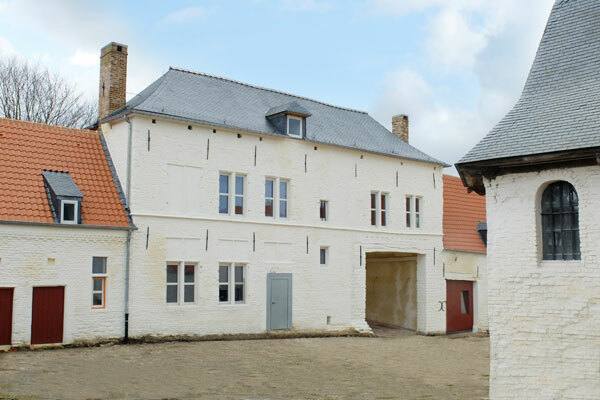 I had to admit, Hougoumont looks much improved and the massive restoration project seems to have been sympathetically done. 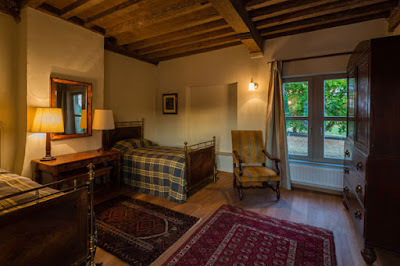 Hhhmmmm . . . . but what would the interiors of the two bedroom guest accommodation look like? Again from the website: This simple first floor apartment in the former gardener’s cottage beside the south gates is furnished to evoke the Napoleonic era and looks out on ancient sweet chestnut trees that also witnessed the bravery and sacrifice here. This is a unique place to ponder the famous Battle of Waterloo by day and night. Unique, yes. And it’s just the gardener’s cottage that will house guest rooms. Very tastefully done guest rooms, at that. Perhaps I jumped the gun when I set my face the enterprise. 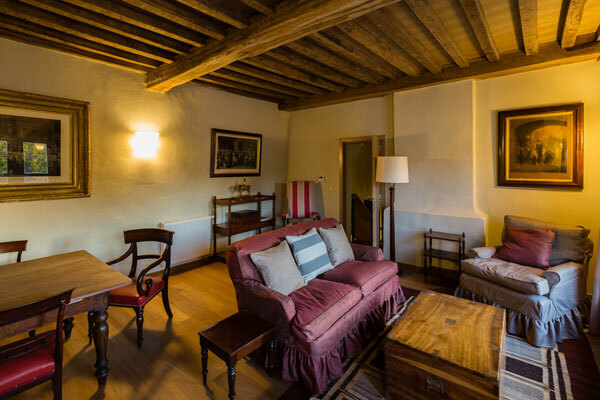 In fact, staying at Hougoumont for a few nights in order to “ponder the famous Battle of Waterloo by day and night” sounds like a capital idea. Heck, it even sounds like a plan. How do you feel about the idea? 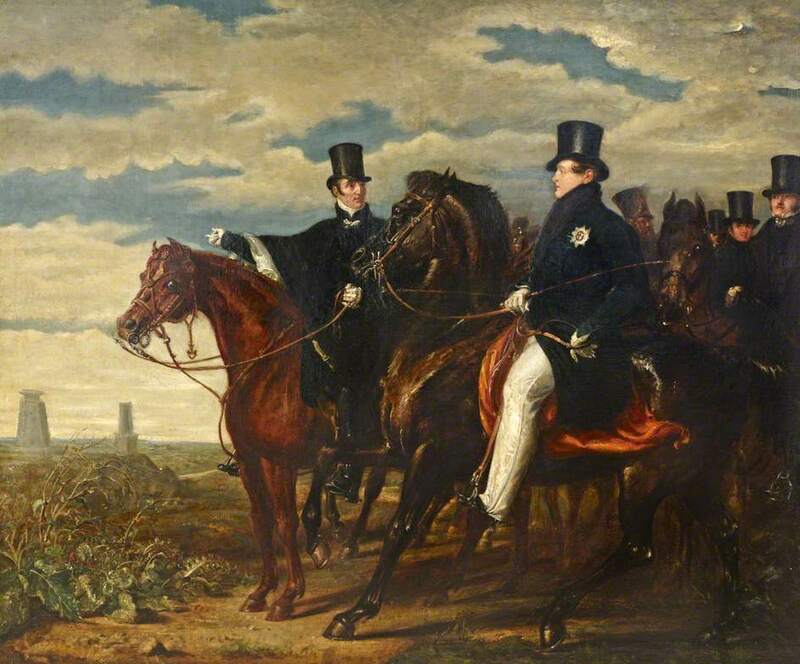 Everyone who has an interest in either the Duke of Wellington or the Battle of Waterloo has heard of Henry Percy, above, the officer sent from Brussels to London on a mission to deliver Wellington’s Waterloo Despatch – the official report that would unquestionably confirm the Allied victory at Waterloo. 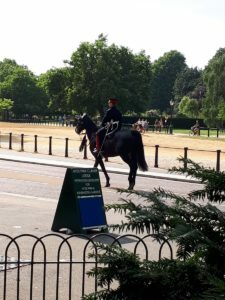 Percy’s ride was recently recreated for the 200th Anniversry of the Battle of Waterloo and many legends, romantic or otherwise, have arisen from the Duchess of Richmond’s Ball, the Battle of Waterloo and Percy’s famous ride. Below you’ll see the uniform Percy wore to the Ball, during the Battle and for the duration of his ride to London – more from the Waterloo200 website here. 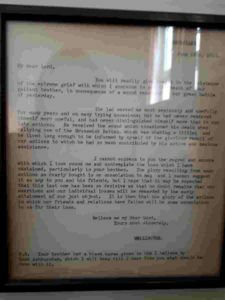 What we have not heard before now are the details of Percy’s journey to London and of the many others who played a part in the delivery of the Despatch. I’ve just finished reading Brian Cathcart’s excellent account of the story behind Percy’s ride and the many ways in which the Allied victory impacted Britain, English society and Europe as a whole. “This is a tragi-comic midsummer’s tale that begins amidst terrible carnage and weaves through a world of politics and military convention, enterprise and roguery, frustration, doubt and jealousy, to end spectacularly in the heart of Regency society at a grand soirée in St James’s Square after feverish journeys by coach and horseback, a Channel crossing delayed by falling tides and a flat calm, and a final dash by coach and four from Dover to London. 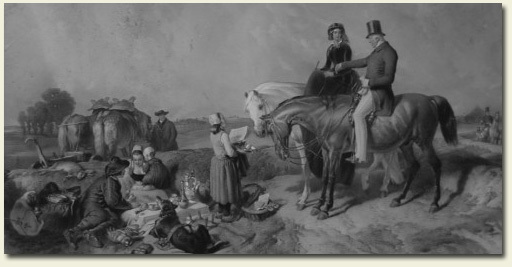 Cathcart uses Percy’s ride as a platform to write about all manner of subjects related to Regency England – road travel, the telegraph, channel crossings, newspapers and banking, society and politics. 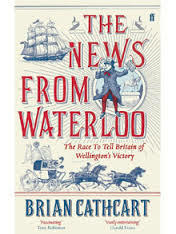 The News From Waterloo is a vivid, entertaining read and should be a part of every Waterloo/Wellington/Regency library. 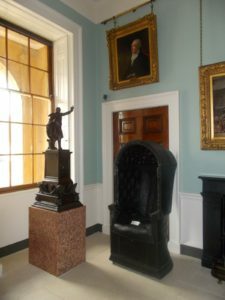 George the IV famously promoted Percy on the spot at the Boehm residence in St. James’s Square once he’d delivered the Despatch and placed the French Eagles at the King’s feet. 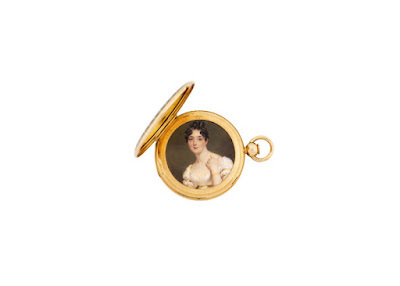 What is lesser known is that Wellington himself acknowledged his debt to Percy by gifting him with a Breguet pocket watch. I urge you to read the full article on the watch which can be found here. 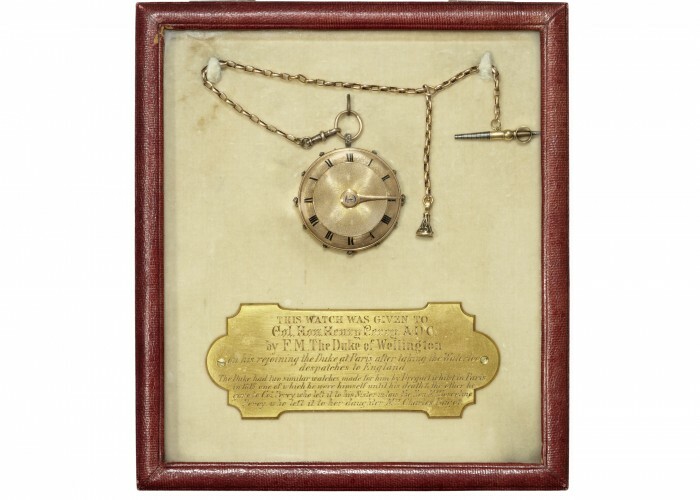 This is a pocket watch that belonged to Major Henry Percy, a British officer who fought at the Battle of Waterloo, and was chosen to deliver the Duke of Wellington’s dispatch back to London. Carrying news of the Allied victory at Waterloo to the British government was a vital task. In recognition of his work, the Duke of Wellington gave Major Percy this watch – made by the Parisian clockmaker Abraham-Louis Breguet, one of the most famous artisans of his time. 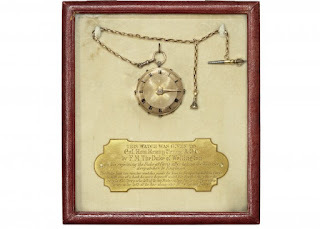 At the same time that Wellington bought Percy’s watch, he also purchased one for himself. Wellington had his watch fitted with an extra cover that held a minature portrait. 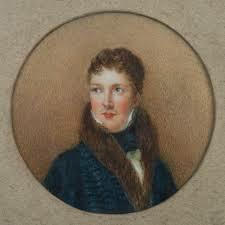 The lady in the miniature is Marianne Patterson. You can read more here. You can read the full Waterloo Despatch as it appeared in the London Gazette here. You’ll also find the link to Hugh Grant reading the Waterloo Despatch in the lefthand sidebar of this blog.